A concert in London’s Hyde Park to celebrate the 90th birthday of Nelson Mandela will screen on ABC1 at 10:10pm Saturday June 28, only hours after it concludes in the UK. The 44664 charity concert for HIV / AIDS is part of an international charity, titled after the prison number that was given to Mandela for 27 years. Artists set to perform at this special event include Queen + Paul Rodgers, Annie Lennox, Simple Minds, Jerry Dammers, Amy Winehouse, Sugababes, Dame Shirley Bassey, Razorlight, Leona Lewis, Jamelia and Eminem. It will be hosted by Will Smith. Oprah Winfrey is also confirmed to make an appearance. Joining them will be South African and African artists Johnny Clegg, Sipho Mabuse, Loyiso, the Soweto Gospel Choir, AIDS orphan choir The Children of Agape – the subject of the award winning film feature ‘We Are Together’, the legendary Papa Wemba and Sudanese ‘war child’ rapper Emmanuel Jal amongst others. The concert will feature numerous surprise appearances, with several major artists keeping silent about their involvement. Royalty and politicians, leading business, sport, film and entertainment names over the world celebrate Nelson Mandela’s 90th birthday at a spectacular concert in London’s Hyde Park. The concert audience has been set at 46,664, to signify Mr Mandela’s Robben Island prison number. He was prisoner 466, incarcerated in 1964 and freed 27 years later. 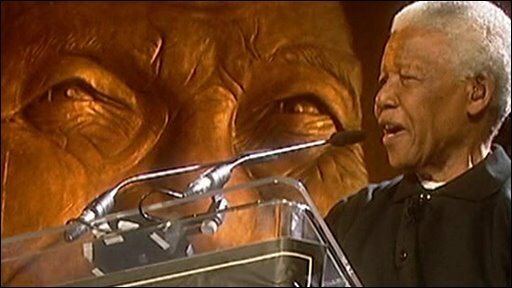 Mandela makes an appearance for his birthday concert – a rare occasion since he is now “retired from retirement”. The 46664 concert on June 27 is part of Mandela’s vision to raise funds to fight the global HIV epidemic. At the time of Mandela’s release in 1990, South Africa recorded 120,000 people living with HIV. Today the number in South Africa is more than 5.5 million.